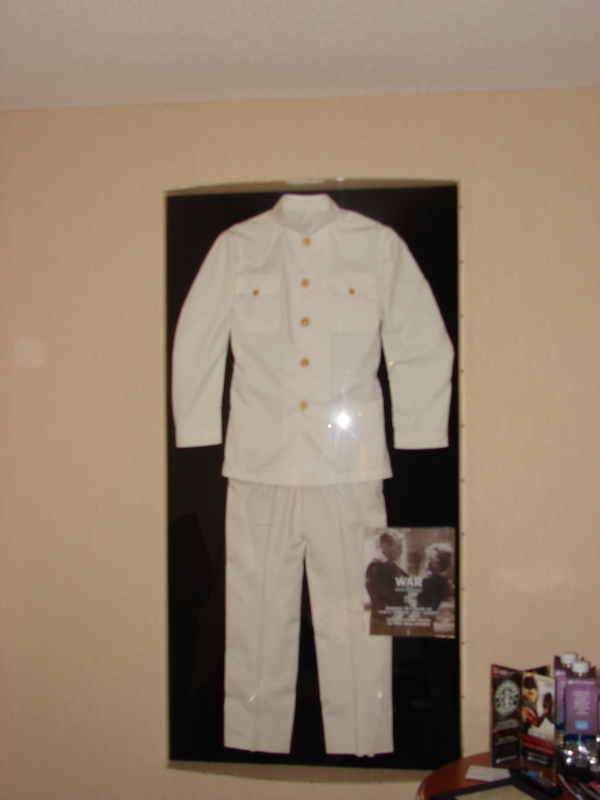 There “it” was — the memorabilia of a lifetime — in a hotel room somewhere in Planet Hollywood. Behind glass, I couldn’t touch it. But I laid my hand up there like Ma Joad would have if she’d palmed Tom in the visitor’s pen. Like mime Patty and mime Cathy touching hands in the opening credits of The Patty Duke Show. There I was — in a time warp from 1983 — watching television from my papasan chair, behind a locked bedroom door, a black window shade, and my faux bamboo Bali Ha’i blinds. “It” was the naval uniform — albeit petite looking and stained — that Victor ‘Pug’ Henry wore in mini-series The Winds of War. Well, actually he wore it in the sequel, War and Remembrance, but nobody remembers that one. ‘Pug’ was played by Robert Mitchum, in the twilight of his career. Yep, by then he was pretty much just going through the motions, acting mainly with his eyes — one blink for yes and two blinks for no. But nobody was really paying any attention to him because Jan-Michael Vincent and Ali McGraw were the real stars. The holy trinity of actors coming together for one big blowout. And then some genius added Peter Graves for good measure. So, of course I have a soft spot for the entire debacle. Nobody could roll his eyes like Mitchum or clench his jaws like Vincent. Or read a line with the fiery passion of McGraw, one of the finest Method actors that Wellesley ever produced. I’m already planning another pilgrimage to Planet Hollywood. Must find Richard Chamberlain’s kimono from Shogun.